As a researcher, I carried gear up and down the mountains and deserts of India, Nepal, Asia, and Northern Africa, and swam to work in an underwater laboratory and with the Ama Divers of Japan. Advisor to police and military training departments, science officer for the Vidocq international forensic society (the "Spock of Vidocq"), advisor to The Discovery Channel (once), and professor of anatomy at a college in the mountains of Mexico where the entrance exam was getting up there without a nosebleed. Left paralyzed after breaking my back, neck, and most of everything else in an accident, I rehabbed using my own sports medicine techniques when doctors said nothing could be done (story here). Harvard clinicians named me, "The St. Jude of the Joints" in my private practice in sports medicine. Photo by Robert Troia, talented photographer who lost a lot of use of one arm. Docs told him he would have to give up photography. I fixed his arm. To thank me he offered to take my picture. He said he'd capture the real me. I thought, "Who could do that?" Besides, at that time, my legs, and most of the rest of me, was seriously injured from an accident and I didn't want anyone to know while I fixed them (more about that on my page of Rare Photos of Early Work). I was working some interesting lung function equations and looked up to see him on a ladder adjusting camera dials and doing cool photographer brainwork. I was delighted at watching such talent, and he said, "Click!" Undergraduate double science major. Graduated with high honors in three years. Worked full-time to put myself through school, at minimum wage scut jobs. Master's degree in environmental and exercise physiology. Masters Award for Outstanding Scholarship. GPA 4.0 (out of 4.0 top). How much does that mean? As the Wizard of Oz said, "I can't give you brains, but I can give you a diploma." While in school, worked full time teaching swimming and lifeguarding at a city pool in a small red swimsuit. Back then without scholarships, girls had to quit sports to work to be able to go to college. Had previously competed in swimming as a national class distance freestyler, two Olympic bids - all AAU. That meant you couldn't (and wouldn't) take a dime; sponsorship wasn't considered real athletics. From the high school math team through grad school, studied mathematics at intervals to help me better understand human heat transfer, and because without geometry, life is pointless. Dual Doctorate - Environmental Physiology and Sports Medicine, combined work at Temple University Medical School and the Biokinetics Research Lab, with concentration in research, GPA 4.0 (out of 4.0 top). No one asks your GPA after you graduate. Took EMT training (Emergency Medical Technician) with the Philadelphia Fire Department. Had to climb ladders and stairs a lot. Internship - Hyperbaric, hypoxic, and hypercapnic response to rest and exercise, decompression physiology. Post Doctoral - U Pennsylvania School of Medicine - Altitude decompression at the Institute For Environmental Medicine. Two University Fellowships and one Presidential Fellowship - Cold Immersion Physiology, Altitude Decompression, and Sports Medicine - "Jolie's a Jolly Good Fellow!" 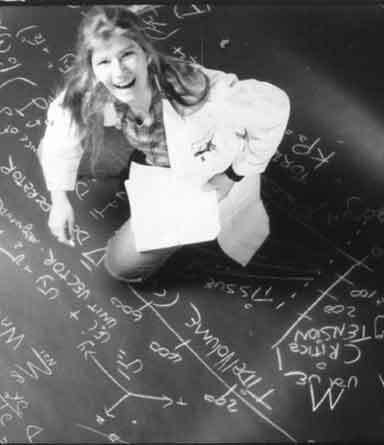 I still swept floors to pay the rent and wrote grants to pay for lab and chamber time. What the grants didn't cover, I swept more floors. Lived and worked as research physiologist in underwater laboratories called habitats, studying human decompression and saturation diving. Wanted to decorate the underwater lab hulls with lots of plastic legs so we could be 20,000 Legs under the Sea. Management didn't like that. Took several Hyperbaric Chamber Technician certification courses. I even passed. Research Physiologist for the US Navy and Army aerospace, warfare, and medical divisions. Hoo ah. Even more schooling, degrees, and studies. My misspent youth again. Labored a year on a Fulbright grant for a blood substitute not needing refrigeration. The project wasn't funded, so after the year I was only a Half-bright. Fellow of the Academy of Wilderness Medicine, First graduating class. "Jolie's a Jolly Good Fellow!" Again. Advanced Wilderness Life Support Course (AWLS). Over three dozen accredited certifications in fitness, life support, health, and exercise management of injury. University professor and instructor of anatomy and physiology, environmental physiology, exercise physiology, statistics, physical training and health, orthopedic and pain rehabilitation in the US and abroad. Director of seven national and international scuba and medicine conferences. Developed National fundraisers for the Cystic Fibrosis and Multiple Sclerosis Societies. For MS, ran several swim-a-thons, developed a Coast-to-Coast bike tour, the City-to-Shore, directed several Ugly Bartender and other named fundraisers, and was their Mystery Sleuth Mascot (all pro bono, but as a vegetarian I didn't ask for my bone). Graduated NAUI college as a SCUBA instructor. Taught and led dive education trips in many locations. My scuba students and dive trip participants did underwater tennis, ballroom dancing, drove pedal cars and bicycles underwater, held umbrellas, and did underwater karate to photograph an underwater calendar. Tiny bubbles! Pioneered putting fitness aboard cruise ships, formerly thought of as only deck chairs and buffets, I led the "sea-change" to adventure and active cruising. I never got the royalties or back pay, but I loved being out to sea. Helped start the first permanent mooring project for dive boats in the Caribbean, to stop anchor damage to the reefs. Did construction and the diving to place them. Raised funds through donors naming their moor. I named mine Othello. No one got it. Othello The Moor. Board of Directors of Sub Ocean Safety (SOS ) Non-profit org project to place hyperbaric chambers in 3rd world, primarily to Nicaraguan Miskito Coast divers who are paralyzed in high numbers from the lobster diving industry, leaving villages decimated. 4th degree black belt in Shotokan Karate. Ow. Competed undefeated in full-contact martial arts. Worked to Muay Thai instructor ranking of Kru Muay and Martial Arts instructor level of Master. Inducted into the International Black Belt Hall of Fame. Awarded Master Instructor of the Year 2009 by the International Martial Arts Association. Inducted into the NAUI scuba instructors Hall of Honor. Vidocq Society 2015 Medal of Achievement for my work as their "Spock of Vidocq" in forensic physiology. Honored with The Humanitarian Award for my work in International Community Health. If a vegetarian eats vegetables, what does a Humanitarian eat? I will now be able to officially find out. Then more stuff, blah, blah.Then I got a life. Then relapsed back to work. I don't know why. I'm actually an underachiever - I want to do much more. I have fun ideas. A few are on the Projects page. This is just what a poor kid from a bad neighborhood was able to do. DoWop. Tall and serious, youngest ever science fair winner age 9. Those big feet came in handy later for swimming. 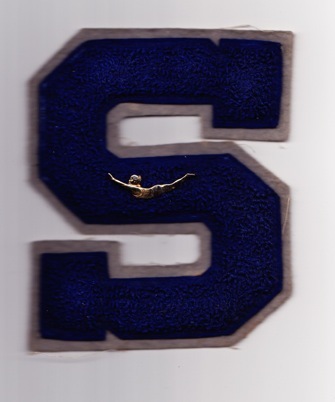 My high school Varsity Swim Team letter. I was so proud. Industrious as always at age 2 and a half. 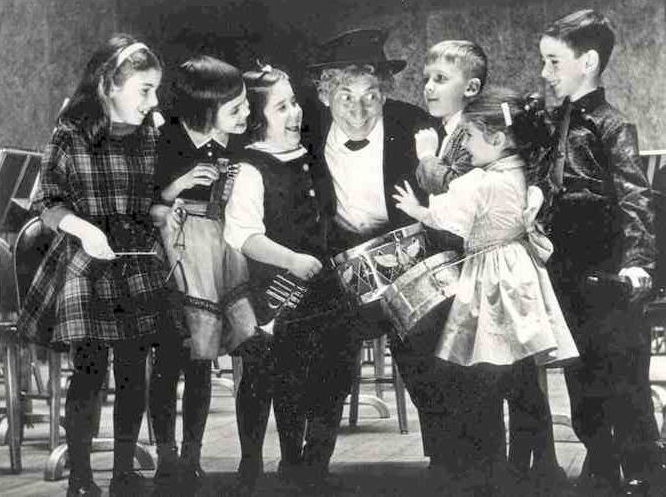 Second from right, sharing a joke with Harpo Marx, who conducted the Philadelphia Orchestra for a program that included us playing The Toy Symphony. 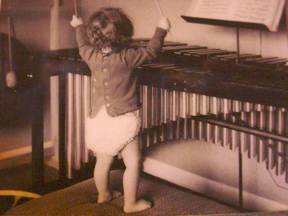 I am not short, just age 3, youngest of the small soloists. I remember the other children and Harpo Marx fondly. I was a kid when our house burned in a fire. The only things left were the clothes we wore (or weren't wearing) when we ran outside that early morning. We didn't have windows in January or beds. The walls were black and gaping. Mom took what money was left and replaced the piano. Priorities! I got into music school - after years of devoted daily practice. My Father said he didn't want me in music, and I obediently obeyed and left the program and the practice. Honor your parents! For years he told his colleagues (other top symphony musicians like himself) he didn't know why I quit music. Music and science have corollaries and I took a degree in acoustics and hearing science to see what could be done for my Grandmother, who was nearly deaf since a childhood bout with flu. 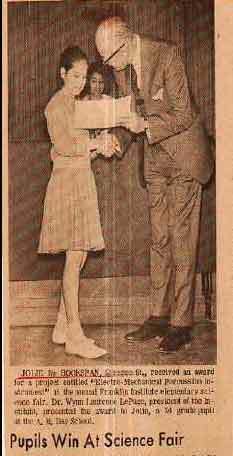 Before that - years of training and rehearsing with a minor dance company. 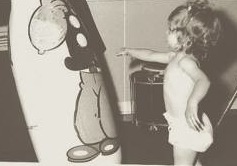 My Mother, a professional dancer, said she didn't want me in dance. I gave it up to obey. But enough about me. To be continued. BACK to the Adventure page or Rare Photos of Early Work page (including the paralyzed years).